As we age, it's never easy to face the prospect of what to do when we need living assistance. But the reality is that two-thirds of today's seniors will eventually need long-term care, with 20 percent needing it for longer than five years. If you are a retirement-age baby boomer or senior, don't wait for a health crisis to occur. You owe it to yourself-and your family-to plan for the future today. Although we've all heard horror stories, great facilities where residents are treated like gold are out there. How do you find them? You have to do your homework, ask the right questions, and look beyond the superficial to find what's right for you. With experience as both an industry expert and a loving daughter, Diane Twohy Masson is passionate about helping seniors find the retirement community that fits their price range, lifestyle, and needs. 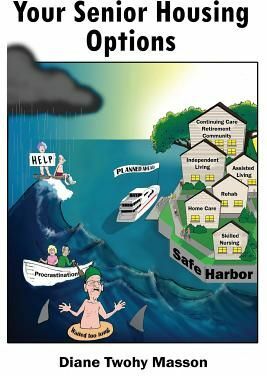 This guidebook offers a proactive approach to navigating the complex maze of senior housing options. It will help you understand the costs and consequences of the various possibilities including home care, independent living, assisted living, group homes, memory care, and skilled nursing care facilities.